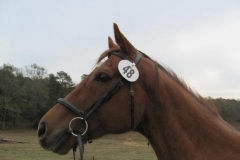 TK’s Turn has found a new home with our most frequent buyer, Dr. Laura Durham-Dixon. Congratulations on to Dr. Laura eighth purchase from Bits & Bytes Farm. Laura and her daughter Leslie enjoy doing hunter paces and dressage shows with the horses they have purchased from Bits & Bytes Farm. TK's Turn gets ridden for the first time by his new mom and three rides later wins blue at a dressage show with a score of 68 percent! 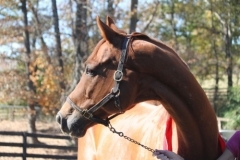 TK's Turn was purchased as a Prospect Horse for sale from the Bits & Bytes Farm Web site in November 2010 by Dr. Laura Durham-Dixon of Giffin, GA.